It’s no secret that I’m a huge fan of American Airlines and the AAdvantage program; pound for pound, I think it easily trumps the other domestic legacy carriers. Today, TPG Contributor Richard Kerr offers some daydream material with a look at some of the best AAdvantage awards redemptions out there. It’s a dynamic time for the American Airlines AAdvantage program. There has been a lot of change lately, which can make anyone with AAdvantage miles nervous, but there’s no need to worry or write off your AAdvantage account balance. It’s still one of the most useful loyalty currencies out there. American is now in the final stages of its merger with US Airways, and there are still more updates on the horizon. At a date in the second quarter of this year (still to be determined), AAdvantage miles and US Airways Dividend miles will be combined, resulting in a lot of new AAdvantage millionaires. 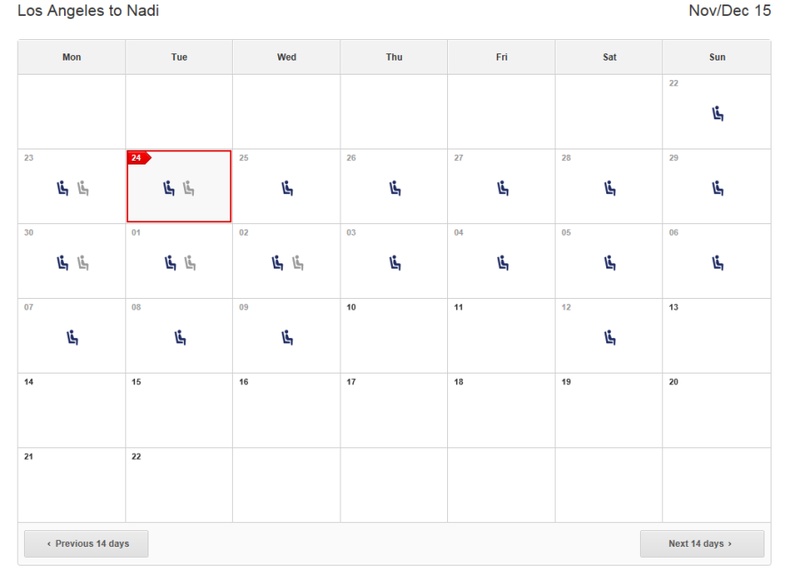 That means now is a good time to book awards before the competition for availability heats up. For inspiration, here are my choices for the top 10 AAdvantage redemptions. Take advantage of MileSAAver awards to reach Europe at a discount. Photo courtesy of Shutterstock. 1. MileSAAver to Europe: What used to be known as Off-Peak awards are now called MileSAAver level 1 . During certain periods throughout the year, discounted award tickets are offered on flights originating from the US or North America. My favorite use of MileSAAver level 1 awards is flights to Europe; from October 15 – May 15, you can fly one-way between North America and Europe for only 20,000 miles. This is significantly less than what any other North American programs charge for similar awards. There’s actually a way to drop the round-trip price even lower (to 36,000 miles); read on to find out how. As an example, There is currently MileSAAver availability every day from February 15 – March 15 between Chicago and Paris. There’s plenty of MileSAAver availability between Chicago and Paris! 2. Fiji Airways Los Angeles Direct to Nadi: For a mere 37,500 miles, you can fly direct from Los Angeles to Nadi, Fiji courtesy of American’s partner Fiji Airways (formerly known as Air Pacific). Fiji Airways flies its new A330’s along that route, and by all accounts it’s a great flight. Going to a tropical paradise on a direct flight and for so few miles is pretty exceptional. You can find availability via American’s Oneworld partner Qantas on Qantas.com. Business class seats can be hard to come by, but economy availability looks pretty good 6 months out. Best of all, there’s no need to worry about high taxes or fuel surcharges—an American Airlines phone agent just quoted me $5.60 in taxes and fees for the flight on November 9, 2015. How great is that? Fiji Airways award availability as shown on the Qantas website. 3. Etihad First Class: Etihad has created a ton of buzz in the travel community lately with the introduction of its new First Class Apartment and The Residence products on the Airbus A380. While you can’t book The Residence with AAdvantage miles, you can book the First Class Apartment or standard First Class Suite, and at a pretty reasonable price. The A380 is currently flying Abu Dhabi to London Heathrow, which costs 40,000 miles one-way. Fuel surcharges and fees cost a whopping $21.60! That’s a huge bargain for this premium product. To search for availability, use the Etihad site and search for award seats. 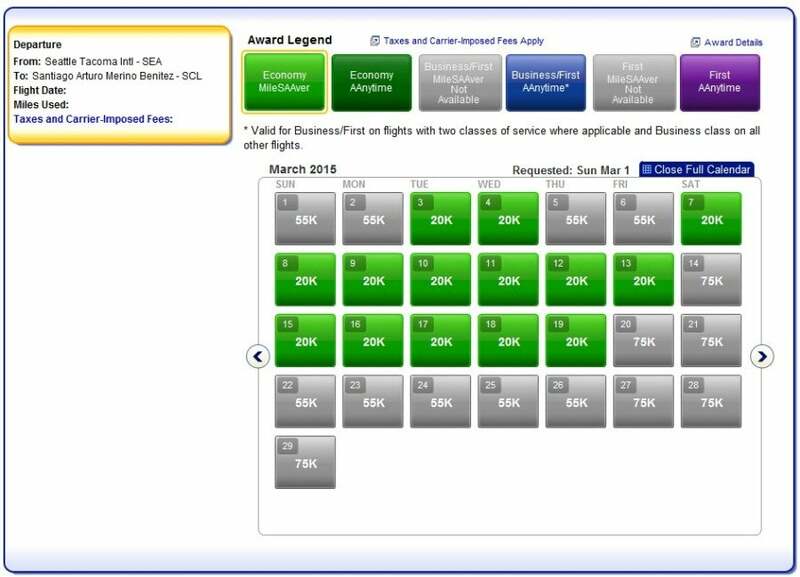 A “Guest First” category seat must be available to use AA miles. 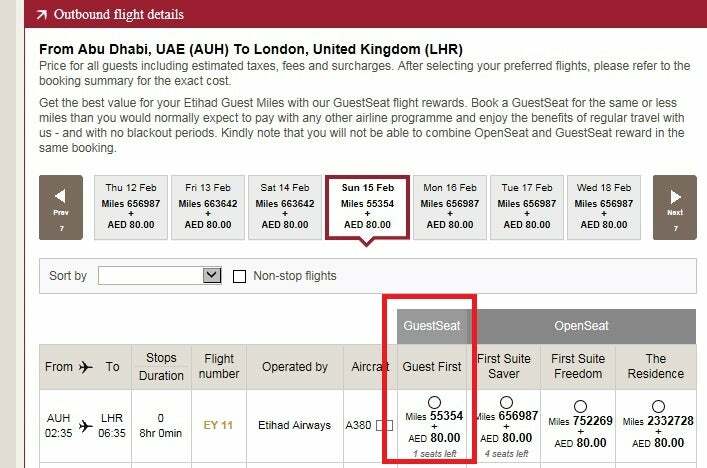 For more info, check out Nick Ewen’s recent post on booking Etihad awards. Look for Guest First availability on the Etihad website. 4. Get Two Trips for Less than the Price of One: During MileSAAver Level 1 dates, a trip to Europe costs 20,000 miles in economy. From Europe to the Middle East/Indian Subcontinent is another 20,000 miles. That means you can see a European country and the Middle East or India for 40,000 miles. That’s 5,000 miles less than the 45,000 miles it would cost to route directly from North America to the Middle East/Indian Subcontinent. You can visit Paris and the Maldives (flying Etihad CDG-AUH-MLE) in one trip and save 5,000 miles compared to flying direct to the Maldives from North America. MileSAAver awards offer great value to South America for almost half the year. 5. MileSAAver to South America: From March 1 – May 31 and August 16 – November 30, flights from North America to Argentina, Bolivia, Brazil, Chile, Paraguay and Uruguay cost a minimal 20,000 miles one-way in coach. Seattle to Santiago, Chile for only 20,000 miles? Yes, please! Availability is not a problem, and taxes and fees are a bargain at $5.60. There’s plenty of MileSAAver availability from Seattle to Santiago in March. 6. 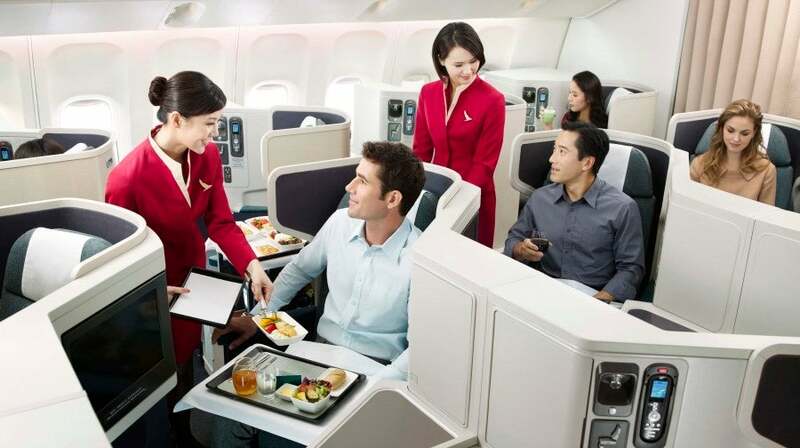 Cathay Pacific First Class: This is one of my favorite first class cabins and seats out there, the service is impeccable, and Cathay Pacific is just a great airline with very convenient routes and schedules from both coasts. At 67,500 miles each way, it’s practically a steal. Cathay also offers this product on its Vancouver to JFK service, so you don’t necessarily have to visit Asia to try it. 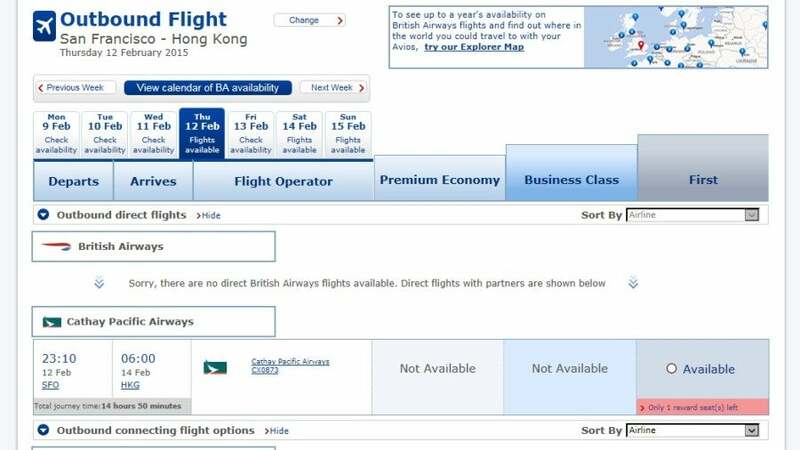 Use the British Airways website to search for availability on one of Cathay’s many routes to North America. 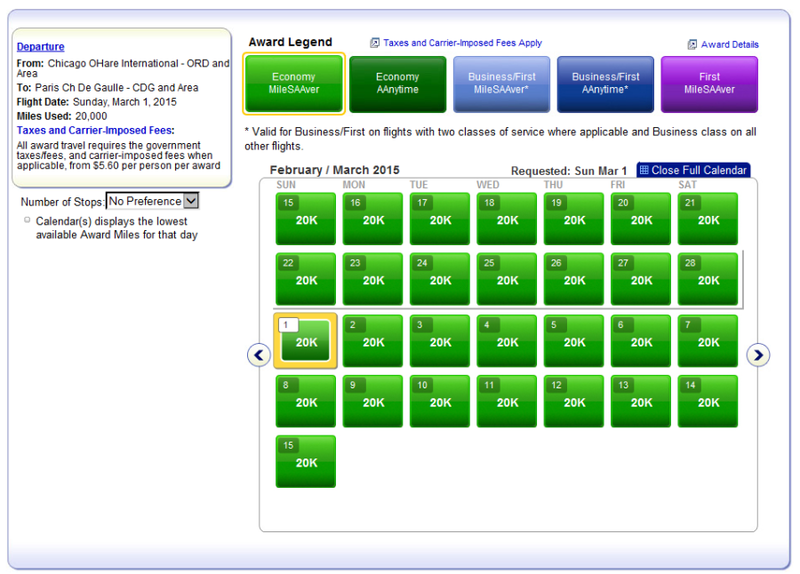 Cathay Pacific award availability shown on the British Airways website. 7. Citi AAdvantage Cardholder Reduced Price Awards: Certain co-branded Citi AAdvantage cards (like Citi /AAdvantage Platinum Select World Elite Mastercard, among others) give you have access to reduced price domestic awards, which shave 5,000-7,500 miles off round-trip award tickets on certain routes within the US and Canada and originating within the 48 contiguous United States. They can be booked in economy or first class. Though these used to only be bookable as round-trip awards, they’re now also available for one-way travel, making them even more versatile. Check the current list of eligible destinations to find out if your city is included. The list of eligible cities changes each month, there’s a lot of overlap from one month to the next, and American makes the details available 4-5 months in advance, so it’s not hard to score a discount. You do have to call to book your award; American just updated its policy for phone booking fees, and it’s not clear if these awards will still incur a $25 charge. Even if it does, the miles you save are worth it! Take advantage of sweet spots in the award chart, like Hong Kong to Australia on Cathay Pacific. 8. Sweet Spots in the AAdvantage Award Chart: Traveling between several regions, when one of them is not North America, can provide great value. One of the interesting sweet spots in the AA partner award chart is flying between the South Pacific (including Australia and New Zealand) and the Asia 2 zone (which includes China, Indonesia, Thailand, and more). One-way awards cost 25,000 miles in economy, 35,000 in business class, and 45,000 in first class. This gets really interesting if you’re looking at flying Cathay Pacific between Hong Kong and various Australian destinations like Sydney, Melbourne or Brisbane. There’s actually a fair amount of award availability on these routes, which Cathay serves on its A330’s with the new business class. That 9-hour flight to Australia in business only costs 35,000 miles! Another sweet spot is Asia 1 (Japan, Mongolia, Korea) to the Middle East/Indian Subcontinent. You can fly Etihad business class on the A340-500 from Tokyo to Abu Dhabi (a 12-hour overnight flight) for only 30,000 miles! I’ll be taking this flight in First Class in April via a mistake fare I booked. 9. MileSAAver to Japan/South Korea: Since I’m currently based in Japan, this great redemption has allowed family and friends to visit for what I would deem as dirt cheap. Between October 1 – April 30, you can fly round-trip from North America to Japan or South Korea for a total of 50,000 miles in economy. United and Delta would charge 70,000 miles at the lowest level of award availability. 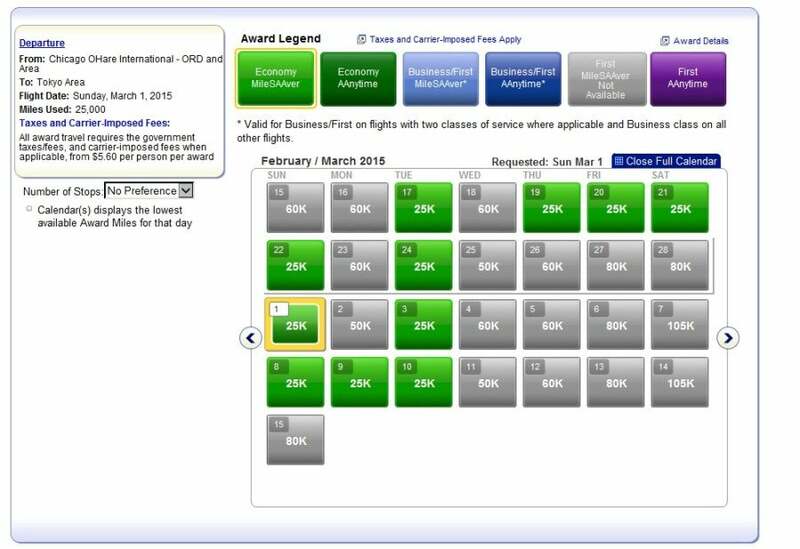 This sweet spot in the award chart means you could fly round-trip to Japan with the current sign-up bonus from either the Citi AAdvantage Platinum Select World Elite Mastercard or the US Airways Premier World MasterCard. Remember, your US Airways Dividend miles will become AAdvantage miles at some point in 2015. Even this late in the game, there are still several seats available for Spring 2015. There’s still award availability to Japan this spring. 10. 10% Cardholder Redeemed Mileage Refund: Certain co-branded cards offer a 10% refund for AAdvantage redemptions. This benefit applies to personal cards only, so the Citi AAdvantage Executive World Elite Mastercard doesn’t apply, but the Platinum Select card does. When you redeem miles from the primary cardholder’s account, you’ll get a 10% mileage refund up to a total of 10,000 miles per calendar year. As I mentioned earlier, this drops the cost for MileSAAver level 1 round-trip awards to Europe from 40,000 to 36,000 miles. Unreal! As shown in some of the examples above, you often have to utilize partner websites to find availability for these awards. Often American phone agents cannot see the same availability you see online, or you may get agents who aren’t even aware of all the partners. You’ll also find some great agents who know exactly where to find availability, but if not, you can try the Hang Up Call Again (HUCA) method. Despite the many changes to the AAdvantage program, there’s no doubt your miles can still carry you a long way to unique destinations – providing real value, extreme luxury, and everything in between. What’s your favorite way to redeem AAdvantage miles?